I've always loved Divisoria for being Manila's all-around market. You can haggle and buy almost anything there without breaking the bank. Although Divisoria is quite far from where I live (I'm a QC gal), it's still a marketplace worth visiting every now and then. But thanks to all the LRT lines, I can easily take a trip to Divisoria without worrying about getting stuck in traffic, and inhaling all the vehicle fumes. But what I loved even more about exploring the grounds of this bustling shopping center was the opportunity to seek refuge nearby. That's when Rubel and I found the comforts of home in Orion Hotel. 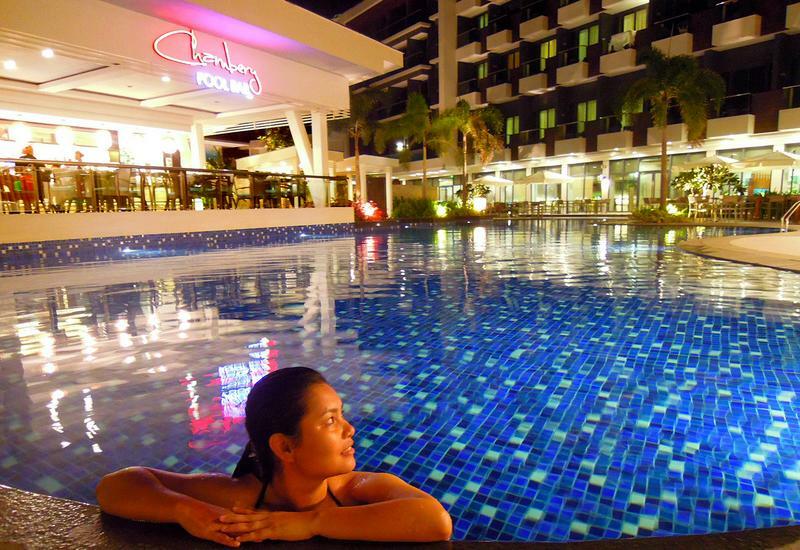 When I found out that Orion Hotel was situated inside the Tutuban Mall building, I got all giddy happy. Imagine my excitement in staying in a hotel that was just atop a myriad of potential things to buy (Tutuban Mall definitely offered its customers a wide-range of cheap items). 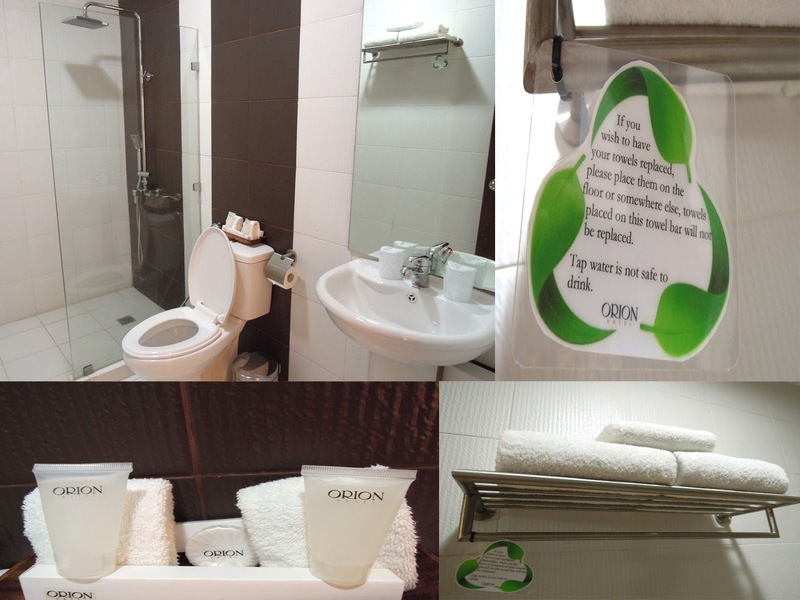 The receptionists of Orion Hotel were very accommodating, and were very easy to transact with. I didn't have a hard time settling my booking reservation with them. Even the staff that mans the elevator was very courteous despite being confined inside it several hours during the day. But aside from that, the division of the lobby and fixtures also looked pleasant and harmonious. Rubel lacked sleep, especially after coming from a graveyard shift. So when we finally got the go signal to check into our room, he took a bath and went immediately to sleep. I on the other hand, went around Divisoria to look for cheap finds. But before that went on, we took photos of the hotel surroundings and of our cozy room. Reliable Wi-Fi Connection - faster than ours at home! Minibar - I ate the Chip's Ahoy, which was quite affordable! The bathroom was also a sight for sore eyes! Although there was a damp smell upon entering the en suite bath (it smelt of wet clothes that weren't sun dried), we were still pleased with the fixtures, bath accessories and toiletries that were placed inside. We had fresh towels, and were also provided with pre-packed toothbrushes, toothpaste, shampoo, conditioner and soap. The en suite bath also had a rainshower stall that was separate from the toilet. I would've enjoyed the rainshower if it heated the water after just a few seconds. Sadly, I had to wait for 2-3 minutes before the water was warm enough to bathe in (despite setting the heater to its maximum level). Also, the toilet wobbled a few times. I think it wasn't perfectly fitted into the ground. It certainly needed fixing. 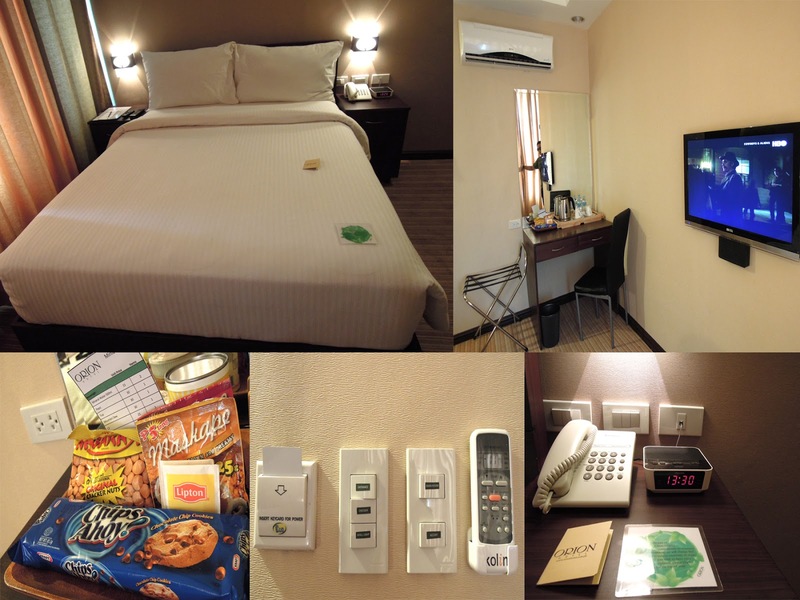 The Superior Room that we availed online was priced at PHP1,688/night. But according on their leaflet, the published rate for our room type was PHP2,925/night. Thankfully, we snagged a more inexpensive deal when we booked from their website. If you're facing the escalators of Tutuban Mall (the one facing 999 Mall), walk towards the right side of the building. You'll see a door on the left that will lead you to an elevator that services the hotel. You won't miss the entrance since the establishment has a huge signage on the wall. Plus, it faces a grocery store that is just across the street. Now, the hotel can also be accessed from inside the mall. It's on the 3rd floor, in case you couldn't find the main door from the ground level. Our stay at Orion Hotel was relaxing. The staff were courteous, the amenities were commendable, and the location was perfect (especially for a shopper like me)! I didn't have to worry about going home and braving through the rush hour after shopping, since Orion was just nearby. It was an ideal escape. I would definitely come back and stay there! Looks like a comfortable place though some minuses in the bathroom department. Loved that they have directions via Jeep. 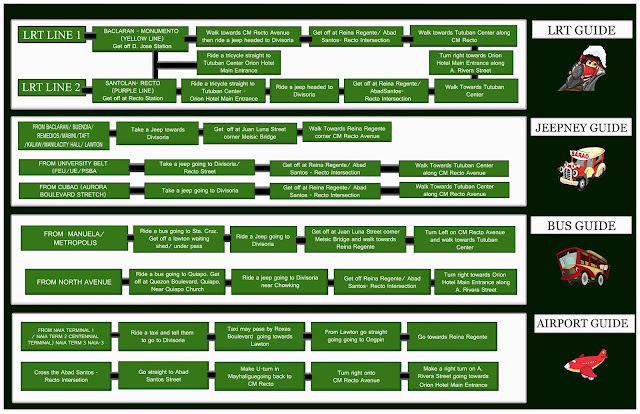 LRT, Bus and airport guide. how come I have never heard of this before..?? are they new..?? P1,688! wow. pwede na to chill out.. though I havent seen it before? the last time i went to Divisoria was the Christmas season..
Whoa I live near the area but surprisingly I have never seen this hotel in Tutuban Center vicinity. The place really looks far from the place, considering the elegant and neat atmosphere. My mother would love this. She has been a Divisoria girl ever since I can remember. This would give her the perfect place to relax after all those shopping. I think so. :) They're literally a few walks away from 999 and 168 Mall. It's actually nestled inside the Tutuban Mall. The Bathroom says a lot to a hotel's ambiance. If it's clean, it must be good. Good job! This is a excellent informative work.